In the fall issue of Hyco Lake Magazine we addressed how to make an outdoor living decision. In that article we reviewed The Inspiration, The Budget, Meeting the Builder, The Initial Meeting, and The Proposal. From inspiration to construction and completion there is a lot of moving parts that need to be monitored to ensure we are on budget and excited with the outcome. In this article we will identify some of these issues and what goes into your proposal to ensure you have a successful build. Now that you have spent hours perusing Houzz, Pinterest, Facebook, and hundreds of catalog pages, you have the inspiration. 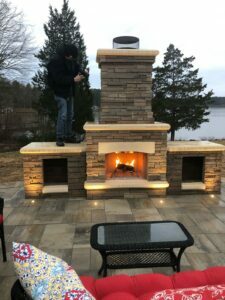 You have reviewed your finances and declared “This is all I’m gonna spend!” You have interviewed your builder, and feel comfortable with them building your dream backyard. You finally have a design and proposal in hand. So now what? Once you have decided to embark on the journey to create an outdoor area you can enjoy, there are things you need to be aware of that will affect your overall experience. This goes often without saying but, all contractors are not the same, nor are all proposals the same. We need to declare clear expectations to keep the relationship positive, and all working towards the common goal. A proposal generally includes all the basics; materials, labor, and equipment. In general, a competent contractor will figure their material correctly. Labor is a little more suspect since most people over estimate what they can get done in a day. It takes a lot of experience and documentation to understand those production rates. Depending on the type of job, equipment will also factor into the final price. Also, behind the final cost of your proposal is profit and overhead – what it takes to run that business. We all say we want the best value, but price is not the only factor in value here. There are a lot of value added services often not priced into the job adequately that will lead to buyer’s remorse down the road. Can the contractor complete your job on time, will they maintain a clean jobsite, will they cut corners, how well will they communicate changes, will the crew be professional, and is the company profitable are all questions that affect your experience. in parachutes, fire extinguishers, brain surgeons, and outdoor living construction! I know I will likely not be the cheapest contractor when I price work, nor do I try to be. We strive hard to pay our guys a living wage, train and equip them well, and have a professional work environment. These all come at a cost, but they all work together to ensure you have a positive experience. Being profitable ensures that in the future we will be available if you ever have a warranty issue, or if you ever decide to expand your outdoor area. An unprofitable contractor may not be around in the future, and you have to go through the entire search process again. An unprofitable contractor will also likely cut corners as well, increasing your need for warranty work. These are issues, we as professionals want you to avoid. All of us have a vested interest in quality contractors. Once the build is underway, open lines of communication are a must to maintain a good relationship. Progress updates, delays, unforeseen problems, and owner changes can really add time, and can affect the critical path of your job. Often times we are working in close proximity to neighbors, as well, which can sour a relationship if things are not openly communicated. As a job is being planned, we often find our wants may exceed our budget. Sometimes, sticking to the plan can be a challenge. It is simple psychology. The big purchase hurts, but added on, that little extra doesn’t seem so bad. Big stores and restaurants do it all the time. The sell goes something like this - “Do you want fries with that?” –“Well I do now!” It just doesn’t seem to hurt so bad to add another $1.99 to that price tag. The same goes along with renovations. You have already bit the bullet on the big purchase, so what is another $1,000-2000. This happens a few times, and BAM - $10,000 extra. This happens all the time in construction, and often times so does the buyer’s remorse. Open lines of communication are vital here to protect both the homeowner and contractor. A simple email, text, or any paper trail will help make sure we cover ourselves. These changes often affect the critical path of the job as well. All contractors are guilty of agreeing to “sure I’ll just add this little bit on for you,” not always immediately realizing the impact of that decision. Simple additions often become very expensive. Extra trips to the supply house, extra time that is required to modify or adjust for the change, delaying your schedule can all really add up. 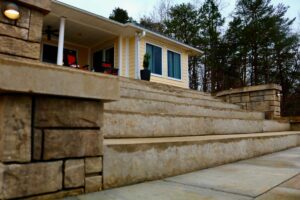 One most recent example is a retaining wall job that we did. It started simple enough, only to become a little extreme, and there is still more to go. It was hard to recognize just how dramatic the change would be to the property, but once we were on our way to completion it became clear that a little more could transform this job into a showpiece. The issue here is that the owner kept adding in the wrong order. 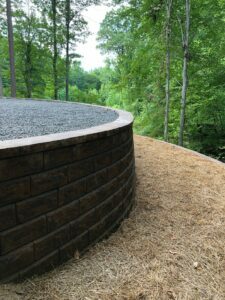 When we build retaining walls, we always need to build from the bottom up. Now that the top is done, it is abundantly clear the bottom needs the same tender, loving care. The issue is we are treading on areas that we have already worked. We also have to work harder to tie each wall together. Overall, the final price is higher than if we had just bit the bullet from the beginning. It is just that the sticker shock is a little much initially, but those incremental additions do not seem quite so bad. As the project progressed, the owner visualized new possibilities and we have taken a pause to further plan for the final build to ensure we nail all the details to accomplish his goals. In the end, we want you to be satisfied with your project. If along the way we discover a change that would really make a positive impact, then we will figure out a way to accommodate. Just be aware that these changes often come at a higher price per square foot than the original price due to a variety of factors. As we move through these jobs, we work hard to document the progress and update our clients. There are so many apps today that make it incredibly easy. We often use Phaze App, which allows us to create a narrative of the job as it progresses. We can take progress shots of the job, and create an active link to the homeowner and others to follow along with our progress. I have found that maintaining engagement keeps everyone on the same page, and maintains a positive customer experience. As we continue to build on this educational series of articles in outdoor living, we will begin to address those add-ons, features, and details that will transform your project into the envy of the neighbors. The one that just has a different feel and look. Lights, water, fire, steps, walls, columns, etc. 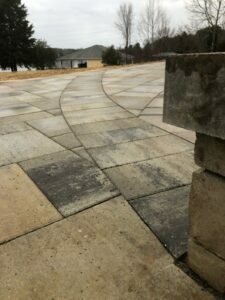 are all key elements to that finish of a premier outdoor living area. We will continue to work to open your mind to the endless possibilities for your backyard, as we are only limited by our imagination! I am Joe Wilkerson, owner of Maplehurst Outdoor Living (434) 579-5625, previously named Southside Hardscape & Landscape Co. My passion is building your dream outdoor living area, and we recently changed our name to better reflect our purpose and mission. We are dedicated to building fine outdoor living projects in Southern Virginia and Northern North Carolina, so you can Unplug & Relax. 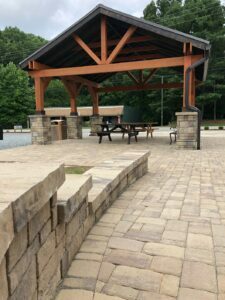 Don't forget to read the first article in this series, "What’s Involved in Outdoor Living Decision?"